­The collective voices of American dissent has manifested into a movement impossible to ignore. “Occupy Wall Street” began in the world’s financial capital, but this week protests have blazed through dozens of cities nationwide. In the Big Apple, over a thousand of "Occupy Wall Street" demonstrators marched into Washington Square Park on Saturday afternoon. Unlike protests on previous two Saturdays, this demonstration finished quite peacefully. Police, who were heavily present at the area and along the whole route, declares that no arrests were made. Meanwhile, lower Manhattan can no longer camp the over 15,000 Americans gathered there for anti-bank protets. On Saturday, the campaigners had to discuss whether they should expand to other public spaces in New York. “This seems pretty revolutionary to me. The spirit of revolution is here and so I need to be a part of it,” says campaigner Talib Kweli. Labor unions, transport workers, teachers, nurses and US veterans standing shoulder-to-shoulder with young activists, spearheading a fight against US wealth inequality and corporate greed. “Young people right now have no hope in our society. 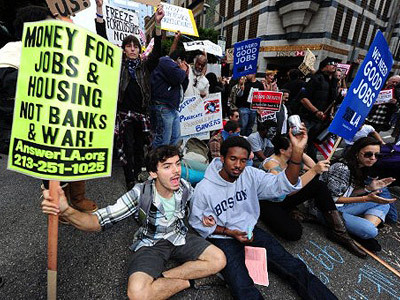 I just want to see a fair and more just society for the young people coming up, and all Americans that are suffering through these hard economic times,” a US army veteran told RT during the protests. 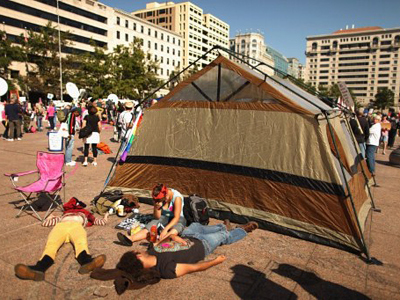 The “Occupy” movement has gained such momentum even the president, who promised change, has been forced to address the issue. “These days, a lot of folks who are doing the right thing aren’t rewarded, and a lot of folks who aren’t doing the right thing are rewarded," he added. While the US has encouraged and supported democratic uprisings in the Arab world, the same events playing out at home have been met with batons, pepper spray and the mass arrest of nearly 800 peaceful protesters on the Brooklyn Bridge. A scene that reminded some of Egypt’s Tahrir Square. 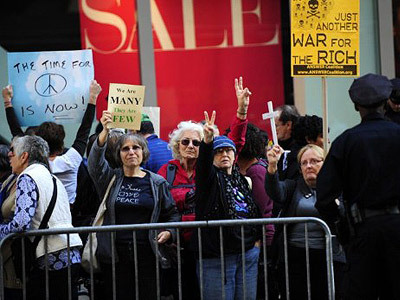 Three weeks into the “Occupy” movement, the New York City Police Department has pumped $2 million into overtime pay. Funds, some critics say, are being used to repress freedom. But this does not abash the campaigners. “Once you are not afraid of being arrested anymore, the whole entire control of the police state disappears. When that happens, there are credible possibilities for us. Suddenly you can imagine a different world and you believe you can be an agent of change,” says Robert Cammiso, who was arrested during an “Occupy Wall Street” demonstration. Two miles from the chaos, at the United Nations, even financier and billionaire George Soros weighed in on the populist uprising. Grievances spreading so loud and large that mainstream media outlets have been left with no other choice but to cover the protests. 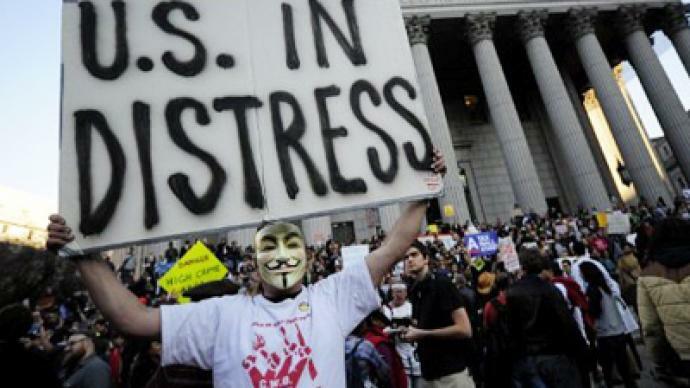 In a matter of weeks, “Occupy Wall Street” has not only mobilized international attention. 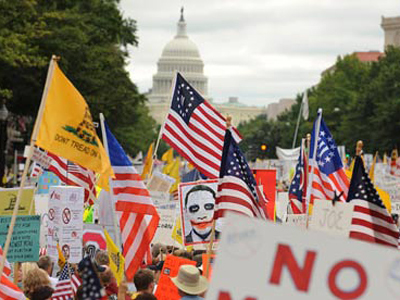 Many believe this ongoing event could become a turning point in the US, where a mass movement goads American politicians into working for the majority of the people – a passionate collective demanding democracy from the very leaders that promote it.